Every religion and culture has what outsiders consider odd traditions or rites of passage, but which seem perfectly acceptable to true believers. Every religion has ceremonies and practices that mark life’s milestones: Birth, marriage, the transition to adulthood, and death, many of which may sound unusual to non-practitioners. Sometime people practice some rituals which are adopted as a part of religion, sometime they practice cultural traditions which seems bizarre to others. There are a lot of traditions that seems really bizarre to the world where it is not followed. Here is a list: 10 bizarre traditions that are still observed around the word. This is followup list to the 10 most bizarre festivals. Here are ten of the most bizarre traditions from around the world that will make your jaw drop! During the celebration of the religious holiday Thaipusam, Hindus declare their devotion to Lord Murugan by piercing various parts of their bodies. It is mainly observed in countries where there is a significant presence of Tamil community such as India, Sri Lanka, Malaysia, Mauritius, Singapore, Thailand and Myanmar. In Tamil Nadu, they celebrate their devotion to the birth of Lord Murugan and his killing of Soorapadman, a vengeful spirit, with a spear. They do this with painful piercings around the body, including the tongue. Over time, the rituals have become more dramatic, colorful, and bloody, with large spears and hooks through the chest and face – some devotees even pull large wagons with ropes attached to their bloody backs. See also; Top 10 Shocking Rituals in India. The biggest tomato fight in the world. La Tomatina, the annual Tomato Throwing Festival, held in the Valencian town of Buñol, Spain. It is held on the last Wednesday of August, during the week of festivities of Buñol. The participants throw tomatoes and get involved in this tomato fight purely for fun. There are many theories about Tomatina. In 1945, during a parade of gigantes y cabezudos, young adults who wanted to be in the event staged a brawl in town’s main square, the Plaza del Pueblo. There was a vegetable stand nearby, so they picked up tomatoes and used them as weapons. The police had to intervene to break up the fight and forced those responsible to pay the damages incurred. This is the most popular of many theories about how the Tomatina started. The most painful Initiation Ritual – For the Satere-Mawe tribe of the Amazon, you can’t become a man if you don’t take part in this ritual. When a young boy becomes sexually mature he goes out into the jungle with the Medicine man and other boys his age to find and gather bullet ants. The insect with the most painful sting in the world. The sting from these ants has been compared to a bullet hitting the flesh. 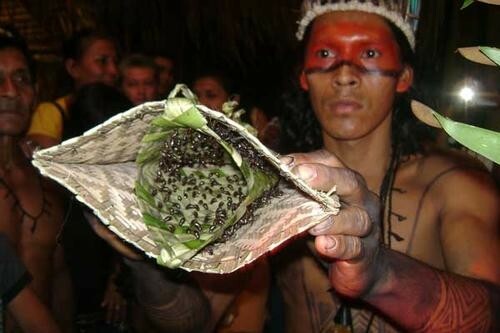 The boys will gather the ants and the ants are then drugged by some herbs given to them by the Medicine Man. Later, while the ants are sleeping in their drug induced state, they are placed into a woven mesh glove with the stinger on the inside. When the ants wake up they find themselves trapped and become very angry and aggressive. The boys must put on the gloves and keep them on for about ten minutes while they do a dance to take their mind off the pain. However the young men of the Satere-Mawe tribe must endure this pain 20 times before they can prove they are men. Funeral rituals for dead relatives is very important inYanomami tribe (Venezuela and Brazil), the people of this tribe want to to ensure peace for the souls of dead person. When a Yanomami dies, his body is burned. The ash and bone powder is mix into a plantain soup. His people then drinks the plantain soup consisting of the dead person’s ash and bone. They believe that by ingesting the remains of a love one, his spirit will live within them forever. Every body must be cremated, because the Yanomami think that leaving a dead body to decay is horrifying. In addition, the soul will be unhappy if he couldn’t find a resting place in the bodies of his loved ones. A dead body must be dispose of as soon as possible, because the soul may come back and haunt the remaining ones. See also; 10 Most Bizarre Funeral Traditions in the World. One of the biggest Hindu religious ceremonies, Tooth Filling. The ceremony is of great importance in the Balinese culture and is a significant in the passage from puberty to adulthood. This ritual is for both males and females and must be completed before marriage; it is sometimes incorporated into the marriage ceremony. This ceremony is executed by smoothing down tooth and eye-tooth. In Hindu Balinese belief system, this celebration helps people to free themselves from all invisible evil forces. They believe that the teeth are the symbol of lust, greed, anger, confusion and jealousy and the custom of filling teeth renders a person physically and spiritually. This ceremony is also a symbol that the person normally female has entered from adolescent to adulthood. Weddings in the Indonesian Tidong community have traditions that are truly unique. Perhaps the most adorable of their customs is the one where the groom isn’t allowed to see the bride’s face until he sings her several love songs. The curtain separating the couple is raised only after the musical requirement is met, and then they can see each other on a dais. But the weirdest of them all is this – the bride and the groom aren’t allowed to use the bathroom for three days and nights after the wedding. Tidong people believe that not practicing the three-day and night ritual would bring terrible luck to the couple – a broken marriage, infidelity, or death of their children at a young age. So the couple is watched over by several people, and allowed only minimal amounts of food and drink. After the three days are up, they are bathed and then permitted to return to normal life. The Famadihana is a traditional festival which is celebrated in both urban and rural areas of the country especially in Madagascar; it is more popular among the tribal communities. It is a funerary tradition, known as the turning of the bones, people bring forth the bodies of their ancestors from the family crypts and rewrap them in fresh cloth, then dance with the corpses around the tomb to live music. 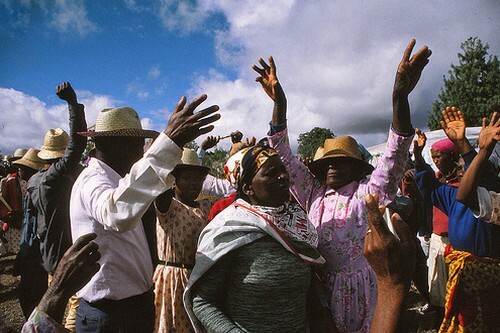 In Madagascar this became a regular ritual usually once every seven years, and the custom brings together extended families in celebrations of kinship. Actually it is occasion to give respect to the dead relative through the transfer of the bones to a permanent place of abode. The families of the razana contribute funds all year to celebrate the festival. The burial tomb is constructed; it is considered that it will place a link between the dead and the living. The relatives of the dead dress well, go to the tomb, to see the remains of the deceased relatives and friends, all closed persons are invited to this event.People and relatives sing traditional songs and dance. The main motive behind the festival originated from the belief of the local people that the dead return to God and are reborn. The Dani (or Ndani) tribe is the indigenous people that inhabit the fertile lands of the Baliem Valley in West Papua, New Guinea. The members of this tribe cut off their fingers as a way of displaying their grief at funeral ceremonies. Along with amputation, they also smeared their faces with ashes and clay, as an expression of sorrow. They will cut off their hand`s fingers to express love to someone they love very much. When a person in Dani`s tribe passes away, his relative like wife or husband cut off his hand finger and bury together with the dead body of her husband or wife, as a symbol of love to her husband or wife. Finger represents body and soul that will always live together with his/her spouse. The number of fingers that will be cut off depends on how many persons She/He loves even though she/he will lose all of her hand`s fingers and will be unable to perform household chores effectively. 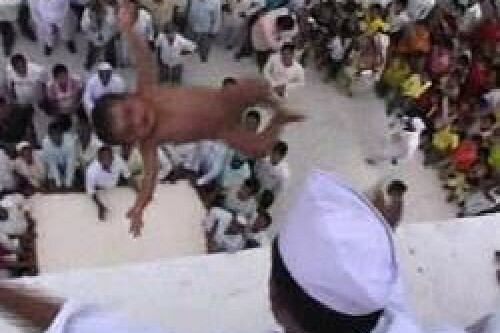 The bizarre ritual of throwing newborn babies off a temple 50ft high and catching them in a cloth has been celebrated in India since last 500 years. It is practised by couples who are blessed with a child after taking a vow at the Sri Santeswar temple near Indi, in the state of Karnataka. The ritual is observed by both Muslims and Hindus every year and takes place amid tight security. The ritual takes place in the first week of December, and is believed to bring health, prosperity and luck to new arrivals. Around 200 babies are dropped by their parents every year while crowds sing and dance. Most of the infants are under two years old. See also; 10 Weird and Astonishing Baby Birth Rituals. The Mourning of Muharram is an important period of mourning in Shia Islam, taking place in Muharram, the first month of the Islamic calendar. It is also called the Remembrance of Muharram. Many of the events associated with the remembrance take place in congregation halls known as Hussainia. The event marks the anniversary of the Battle of Karbala when Imam Hussein ibn Ali (R.A), the grandson of the Prophet Hazrat Muhammad (S.A.W), and a Shia Imam, was killed by the forces of the second Umayyad caliph Yazid I. The event reaches its climax on the tenth day morning, known as Ashura. Some groups of Shia Muslims join in an ardous practice that involves body whipping with special chains that have razors and knives attached. This tradition is practiced by all age groups; in some regions the children are forced by their parents to take part. This custom is observed by the people of Iran, Bahrain, India, Lebanon, Iraq and Pakistan.